Based in Ballina, Co Mayo and established by the late Tiernan Gill Snr in 1971, Gills Driving School is one of the most progressive driver training organisations in Ireland. These days Tiernan’s son Tiernan Jnr runs the day to day operation and he has continued improve on their level of service following their latest accreditation. For the company are now the only driving school in the country to become a Quality and Qualifications Ireland (QQI) verified training centre. Their functions include those previously carried out by the Further Education and Training Awards Council (FETAC); the Higher Education and Training Awards Council (HETAC); the Irish Universities Quality Board (IUQB) and the National Qualifications Authority of Ireland (NQAI). They validate education and training programmes and make extensive awards in the Further Education and Training sector including in the Education and Training Boards. They also make awards in Higher Education mainly to learners in private providers. The universities and institutes of technology largely make their own awards. “This is a massive plus for the business,” Tiernan Jnr told Irish Trucker. “A lot of hard work has gone in to receiving the QQI Award. It was a two-year programme and it allows us to teach up to Level 5. “We are the only company in Ireland and the UK that will be allowed to offer drivers a Load Securing Course, which they all must have completed by May 2017. With 54 highly trained employees ensuring that Gills Driving School continues to maintain the high standards of service that their customers have become accustomed too, the range of services has increased. Driving courses are available in cars, light commercials, jeeps and trailers, rigids, artics, buses and mini-buses, while other course include Driver CPC, Advanced Driver Training, ADR Courses, Defensive Driver Training, Secure Loading Programme, Tachograph Courses, 4x4 on/off road and First Aid. Gills Driving School offer these services at many different Road Safety Authority Approved CPC centres across the country with courses taking place in Ballina, Castlebar, Belmullet, Sligo, Carrick on Shannon, Roscommon Town, Longford, Galway City, Limerick, Tralee, Thurles, Kilkenny, Arklow, Drogheda, Maynooth, Waterford and Cork. “We offer a wide range of courses and customers can be assured that each trainer is trained to the highest standard, so they are receiving the best possible training. 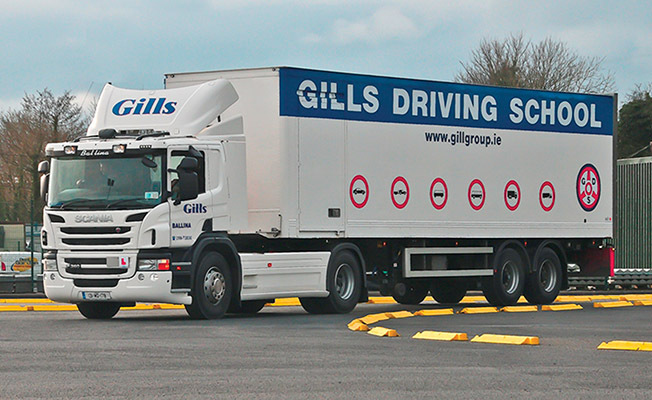 Gills Driving School have begun a new initiative where they recommend drivers to companies and Tiernan Jnr revealed that the demand for drivers has increased in Ireland this year. “There is a huge demand for van and truck drivers. So, we have started recommending drivers to companies. It is our way of giving something back and we have received some very positive feedback from that so far. “These are exciting times for us as we continue to invest in the business and we are always adding to the fleet to ensure that the customer gets the best service possible. Brooklands Gas Ltd: FLOGAS is the household name around the West of Ireland for bottled gas. They are a bottling and distribution plant for Flogas bottled propane and butane cylinders. This is one of Ireland's largest gas bottling and filling plants in operation. Known as the “bottle with the collar”- the safest cylinder on the market, Brooklands Gas Ltd supply bottled gas to shops, pubs, restaurants, hotels, take-aways, households, B&B's in Counties Mayo, Galway , Leitrim and Sligo.